Their breakthrough came with the score for a 1925 charity show, THE GARRICK GAITIES, which introduced the classic valentine to their hometown, "Manhattan." From 1920 to 1930 Rodgers & Hart wrote an astonishing array of musical comedies for Broadway and London's West End. At their pinnacle the team was writing an average of four new shows a year, and among these were: DEAREST ENEMY, BETSY, PEGGY-ANN, THE GIRL FRIEND, CHEE-CHEE and A CONNECTICUT YANKEE. In 1930 the team relocated to Hollywood, where they contributed songs and wrote the scores for several movie musicals, including the landmark LOVE ME TONIGHT starring Maurice Chevalier; THE PHANTOM PRESIDENT starring George M. Cohan; HALLELUJAH, I'M A BUM starring Al Jolson; and MISSISSIPPI starring Bing Crosby and W.C. Fields. They were lured back to New York by legendary Broadway producer Billy Rose in 1935 to write the songs for his circus musical spectacular, JUMBO. Their score introduced "The Most Beautiful Girl In The World," "My Romance" and "Little Girl Blue," and Rodgers & Hart were back on Broadway. From 1936 to 1943 Rodgers & Hart wrote a series of Broadway musical comedies, each of which seemed to top the one before in terms of innovation and box office success. ON YOUR TOES (1936), BABES IN ARMS (1937), I'D RATHER BE RIGHT (1937),I MARRIED AN ANGEL (1938), THE BOYS FROM SYRACUSE (1938), TOO MANY GIRLS (1939), HIGHER AND HIGHER (1940), PAL JOEY (1940), and BY JUPITER (1942) dazzled Broadway in spectacular succession, and collectively offered such classic songs as "There's A Small Hotel," "I Wish I Were In Love Again," "My Funny Valentine," "Where Or When," "The Lady Is A Tramp," "Spring Is Here," "Falling In Love With Love," "Sing For Your Supper," "This Can't Be Love," "I Didn't Know What Time It Was," "It Never Entered My Mind," "Bewitched," "I Could Write A Book," "Nobody's Heart," and "Wait Till You See Her." The partnership disbanded temporarily early in 1943 when Rodgers collaborated with Oscar Hammerstein II on OKLAHOMA! The Rodgers & Hart partnership resumed with a revision of their 1927 musical comedy A CONNECTICUT YANKEE, and the new production (which featured six new songs including "To Keep My Love Alive") opened on Broadway November 17, 1943. Already ill at the time, Lorenz Hart died less than a week later. Richard Rodgers then pursued a career with Oscar Hammerstein II, and their collaboration over the next two decades resulted in the following musical plays: CAROUSEL (1945), ALLEGRO (1947), SOUTH PACIFIC (1949), THE KING AND I (1951),ME AND JULIET (1953), PIPE DREAM (1955), FLOWER DRUM SONG (1958) and THE SOUND OF MUSIC (1959). The team wrote one movie musical, STATE FAIR (1945), and one for television, CINDERELLA. (1957). Oscar Hammerstein II died in 1960. Richard Rodgers continued to write for the musical stage for the rest of his life; his fortieth, and final, Broadway musical, I REMEMBER MAMA, opened on Broadway less than eight months before his death on December 30, 1979. In March of 1990, Richard Rodgers was honored posthumously with Broadway's highest honor when the 46th Street Theatre was renamed in his honor. In 1999, Rodgers and Hart were each commemorated on United States postage stamps. In 1940, Rodgers & Hart's musical PAL JOEY had its New York premiere on Christmas at the Ethel Barrymore Theatre, before moving to the Shubert Theatre and finally to the St. James. The show ran for 374 performances. In 1919, Richard Rodgers and Lorenz Hart copyrighted their first professional collaboration, the song "Any Old Place With You"" from A LONELY ROMEO." In 1927, Rodgers & Hart's musical A CONNECTICUT YANKEE had its New York premier at the Alvin Theatre. The show ran for 418 performances. In 1937, Rodgers & Hart's musical I'D RATHER BE RIGHT opened at the Alvin Theatre in New York. The show ran for 290 performances. In 1942, Rodger & Hart's BY JUPITER premiered in New York at the Shubert Theatre. The show ran for 427 performances. 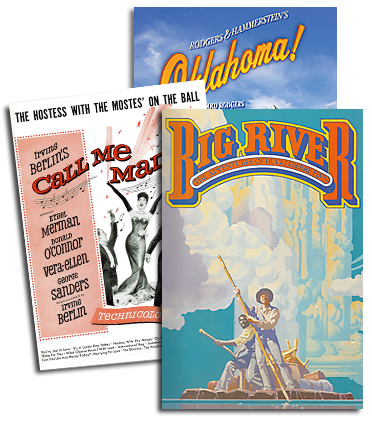 In 1975 the musical revue RODGERS & HART, conceived by Richard Lewine and John Fearnley, premiered at the Helen Hayes Theater and ran for 108 performances. The show featured over fifty songs composed by Richard Rodgers with lyrics by Lorenz Hart. In 1938, Rodger & Hart's musical I MARRIED AN ANGEL had its New York premiere at the Shubert Theatre. The show ran for 290 performances. In 1937 Rodgers & Hart's musical BABES IN ARMS had its New York premier at the Shubert Theatre before moving to the Majestic Theatre for a total of 289 performances. In 1936 Rodger & Hart's musical ON YOUR TOES had its New York premiere at the Imperial Theatre before moving to the Majestic Theatre in November. The show ran for a total of 315 performances. In 1937, ON YOUR TOES closed on Broadway after a run of 315 performances. This dance musical would later be revived on Broadway during the '50s, and again in the '80s.